Language training is a crowd favorite in any global company's training mix. But how valuable is it to the business? 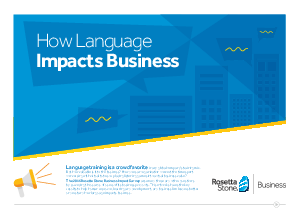 The 2016 Rosetta Stone Business Impact Survey answered this and other key questions by surveying thousands of users of its business products. This e-book shares the key results to help human resource, learning and development, and business line leaders better understand how language impacts business.